Large Art Deco style 3 light semi flush ceiling light with antique brown finish metalwork is handmade in the UK and features a custom made, 6mm thick acid etched opal white glass dish on sculpted long rod suspension. 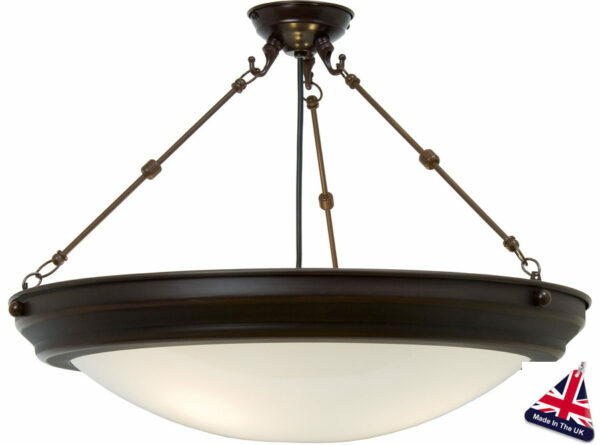 A large ceiling light, featuring a circular semi-flush mount and multi-rod suspension, with deep circular frame and curved glass up-lighter dish. This magnificent ceiling light houses three lamp bulbs, has a diameter of 66cm and a drop of 45cm making it suitable for any larger room with a low ceiling. Handmade in Britain, this Art Deco themed ceiling light is in stock and available for next working day delivery.